We hope you enjoyed the Christmas season and wish you a happy and prosperous new year! A friend of Sable Island recently gave us this perfectly preserved desk calendar from fifty years ago that we are pleased to share with you. It is a very interesting history nugget. 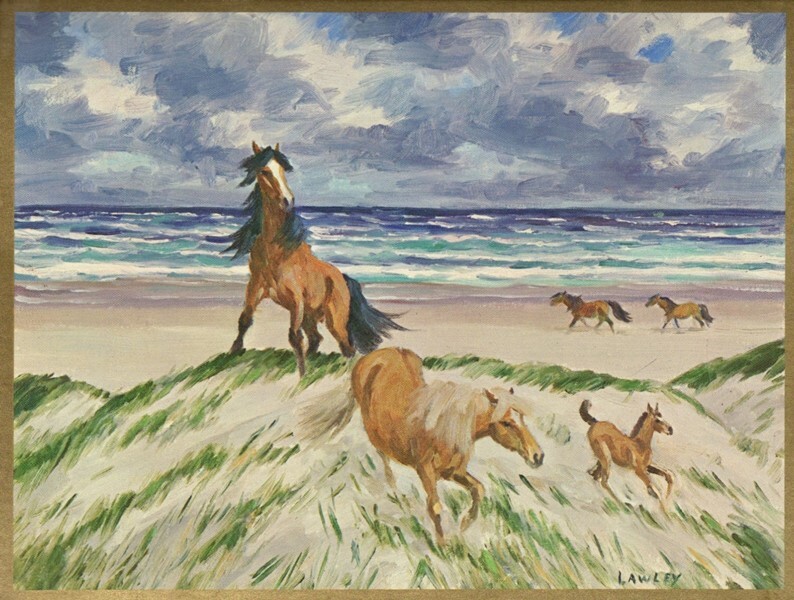 Royal Trust, self-identified as “Canada’s Leading Executor and Trustee”, chose an image by Douglas Lawley entitled “Wild Ponies – Sable Island” for the year 1968. The information they included about the horses is a fascinating glimpse of that point in time. Additional information about the image (see below) interestingly mentions a population of 200 horses compared to approximately 500 today. It states a similar history of the horses’ arrival on the island as the one we now believe. It uses slightly different language related to the horses, like a “gang of ponies”. And it mentions that most horses were bays and browns, with some black, and that light-coloured horses, like the mare in the illustration, were traditionally named Isabella.